Centered around the type of plot device usually riddled with questionable developments, Christopher Nolan’s latest mind-game is a full-blown success. Leonardo DiCaprio is Cobb, the head of a mercenary dream-team (pun intended!) of information thieves, the kind that get into your head while you sleep. Most of the time, Cobb and his team are the best, they know how to break down the safeguards of the mind and “extract” desired information for their employer. But when Japanese business mogul Saito hires them to do the nearly impossible – to plant an idea in someone’s mind, rather than take it (called “inception”) they get into a swirling mess of dreams-within-dreams that nearly kills them all. Time travel and dream sequences are more often than not the undoing of many a decent adventure picture. Interesting premises go sour when logic falls by the wayside or dreams stray too far from reality. An easy way out is for a writer or director to make up new rules as they go, in order to excuse a digression from the structure of earlier scenes. So all the credit to Nolan for offering up just enough exposition to let us in on how things work, and then not bending his own rules too much. But plot devices aside, this movie is a slam-bang thriller with plenty of suspense and a bare minimum of throw-away dialogue. DiCaprio brings gravity to the role – and the team – that anchors the scrambling sequences and the racing, detailed plot. The supporting cast is exactly what you want in an adventure picture. Nobody hams it up, nobody gums it up, and almost everyone delivers a measure of charm and individuality without trying to make more of their character than the script allows for. Yet, Ellen Page could stand to take a closer look at some of Helena Bonham-Carter’s work in movies like The Wings of the Dove or Fight Club, inspiration that might give her acting a touch of vitality to replace the youthful know-it-all approach she has so far been using extensively in her short career. Age may be the answer. I was very happily impressed with Joseph Gordon-Levett, who nearly looks too young to pull off the part but within the first half-hour establishes himself as a sure-footed young man whose action “skills” go from believable to spot-on cool. The concept of tiers of sleep, and the corresponding changes in time equivalent to real-life time is fascinating and provides brilliantly layered tension in the closing sequences. Essentially, dream-time is slower than real time, so that a few minutes of real time can be an hour in dream time. Go a layer further (a dream-within-a-dream) and time slows down exponentially, and so on. Cobb and his crew get spread out over three levels of dreaming, so that as time is winding down, it does so at a very different pace for each character. It’s a masterful tool for suspense because it allows for immediate drama to occur simultaneously with slower, dialogue-driven scenes. To get into too much detail would give away key plot points and also be rather dull – the music, pacing and visuals are so expertly achieved that to articulate their impact would be insufficient. 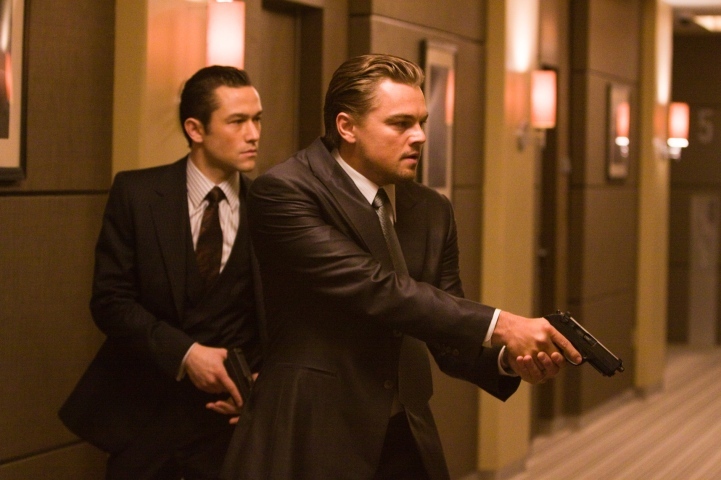 Suffice it to say that Inception is so far one of the best films and easily the best adventure movie of 2010. This entry was posted on July 18, 2010 by Ian Kay. It was filed under Inception (2010) and was tagged with christopher nolan, dicaprio, inception.